Rubber Flooring is durable and slip resistant, thus are ideal for commercial gyms and large scale weight rooms, animal hospital, garden paths, golf clubs, sports surface, equestrian use, pool and Jacuzzi and gym areas & children play area. The Rubber Flooring we offer is provided in both sheets and tile forms. These Rubber Flooring are known to have one of the hardest wearing flooring finishes. They are available at affordable prices. Children Play Area Rubber Floorings at most reasonable prices. 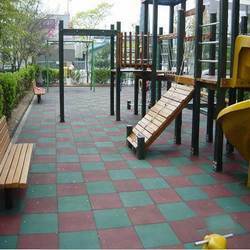 Assuring durability and high skid resistance, these floorings are ideal for children play areas and parks. Clients can lay down these rubber floorings on different kinds of surfaces, including sand, soil, wood and tarmac. To meet the variegated requirements of the clients, we offer these floorings in various colors, patterns and designs. We provide our clients a high quality assortment of Recycled Rubberized Floorings in various designs and sizes at most economic prices. Designed and developed using high-0grade raw material, our range is at par with the set industrial norms and standards. Resistant to oil, grease and acids, these floorings assure aesthetically pleasing surface finish. We are engaged in offering various kinds of EPDM Floorings to our clients spread across the national as well as global market. Assuring proper cushioning and hardness, these flooring are made using synthetic rubbers. 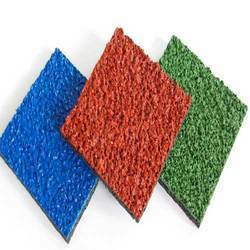 These soft and cushioned flooring are used as porous safety matting for the kids' play areas in the schools, malls and other areas. To suit the exact requirements of the clients, we offer these flooring in various sizes, shapes and colors.